Salesforce is one of the biggest names in customer relationship management software. That’s thanks to its ease-of-use, its app marketplace, and its customizability. In recent years, Salesforce has taken that customizability a little further by allowing customers to choose between two user interfaces (UIs): Salesforce Lightning vs Salesforce Classic. As their names imply, Classic is the original Salesforce interface, now in its most up-to-date incarnation. 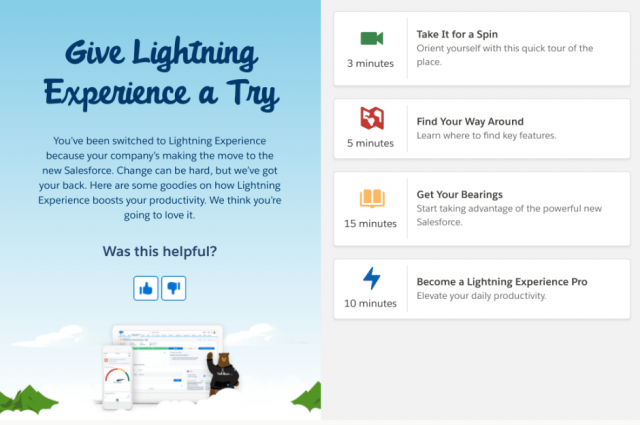 Lightning, meanwhile, is the brand new UI that completely changes the Salesforce experience. 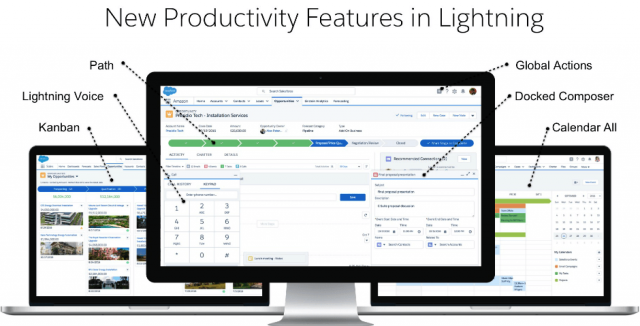 All of Salesforce’s new features are now built for the Lightning UI. Classic exists largely in an “as is” state for those companies that cannot yet make the switch. This may be due to customized interfaces, workflows, or just the general difficulty of making a big switch with thousands of users. A few years ago, it made sense for smaller businesses to stay away from Lightning, since the feature-set wasn’t as fully-formed as what you could use via Classic. That’s becoming less and less the case, as most key features have migrated to Lightning from Classic. We won’t get into a overly detailed discussions about the major feature differences between Classic and Lightning, because it’s a moving target with changes happening all the time. Those looking for in-depth guidance should check out Saleforce’s feature comparison chart – spoiler alert, it’s very favorable towards Lightning. Salesforce Lightning vs Classic: Which Should You Use? 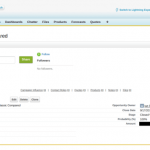 Until the the Lightning release, Salesforce Classic was the interface for the CRM platform. When you first take a look at Salesforce Classic you can see right away that it is not a modern web UI. It is very compact and text-centric with little attention paid to graphics and icons. The graphics that do exist are typically small and aren’t displayed in high resolution. The text is also very small by default, and on a modern monitor there is a massive amount of unused space that at times makes everything feel way too confined and at others far too spread out. The overall result is that it is not easy to absorb information quickly in the Classic interface and navigation can be a little bit clunky. Classic exists mostly for longstanding Salesforce users who aren’t ready to move to the newer interface. New users are put on Lightning by default, with the option to switch to the Classic interface under their user icon in the upper-right corner. It’s possible that some companies new to Salesforce will have particular needs better suited to Classic. As a general rule, however, Lightning is the version of Salesforce to aim for since it’s the default for new users and the future of the platform. Though we’re talking about Lightning as an interface, it’s actually a lot more than that. It’s an entire framework that developers can use to create modern Salesforce apps. Third-party service integrations are easier, and you can also build custom components for the CRM platform’s web interface. The Lightning UI itself is a modern web UI with a mix of easier-to-read text, icons, and graphics providing a snapshot of your business. To see an example of how dramatic the difference is look at the Home tab in both interfaces. Lightning offers a number of charts and lists to show you the current state of your business at-a-glance. Classic, by comparison, is focused on text and the Home tab is primarily a social style news feed showing your organization’s latest posts, emails, and tasks. 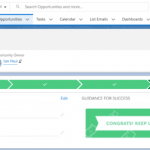 Drilling down a bit further, if you look at an opportunity record in Lightning, you see what Salesforce calls a highlights panel at the top with common action buttons, and the current state of the opportunity. Classic, on the other hand, shows a text-centric view of the same information. Figuring out whether the deal has closed requires scanning the small text of the “Opportunity Details” section. If you have Salesforce veterans on your team they are likely familiar with Classic. That could be an advantage if your team is returning to Salesforce, and the focus is on getting up and running as soon as possible. But this is only a short term solution as Lightning is the platform in actively support. In fact, you may find that Salesforce automatically switches you to Lightning after a few days or weeks on Salesforce Classic. 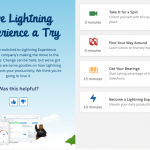 For the vast majority of users Lightning is the way to go, especially if your company is brand new to Salesforce. The interface is much more comprehensible, faster, and it is the future of the Salesforce platform. Classic, meanwhile, can work for teams returning to Salesforce or those unable to move yet. If you do choose Classic, be aware there’s a little uncertainty about its future. Salesforce has yet to announce an end date for Classic interface support. 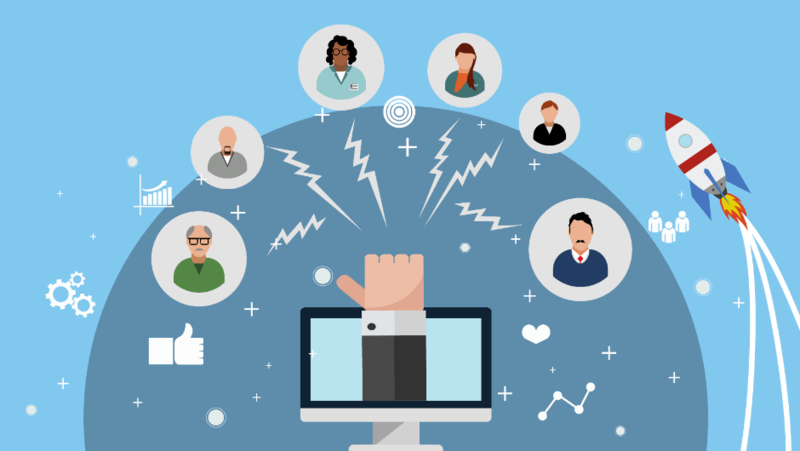 The general consensus online is that Classic will be around for years, though, as Salesforce closes any existing feature gaps and continues support for large enterprises. There’s no guarantee that’s the case, however, so choose wisely. It would be a real pain to get settled on Classic only to have to turn around a year later and migrate to the newer platform. Ultimately, new users should stick with Lightning unless there is some clear feature advantage to going with Classic. Even then, you’ll want to move to the newer interface when those key reasons for using Classic are solved in Lightning. If you’re not yet a Salesforce user and want to learn more about the software, then check out our full Salesforce CRM review. If you’re up and running already with Salesforce, you should get in touch with your Salesforce representative to make sure that whatever advantage you’ve found will be duplicated in Lightning at a later date.